According to a tweet just posted by Sedo broker Dave Evanson, Sedo brokered the sale of the MM.com domain name for $1,200,000. This sale will rank as the sixth largest public sale of 2014 when it is reported and recorded by Ron Jackson in DNJournal. I believe that Dave has had this exclusive listing for about two months. Just sold mm(. )com for $1,200,000!! Congrats to buyer and seller!! The seller of MM.com appears to be a company called Minnesota MicroNet. 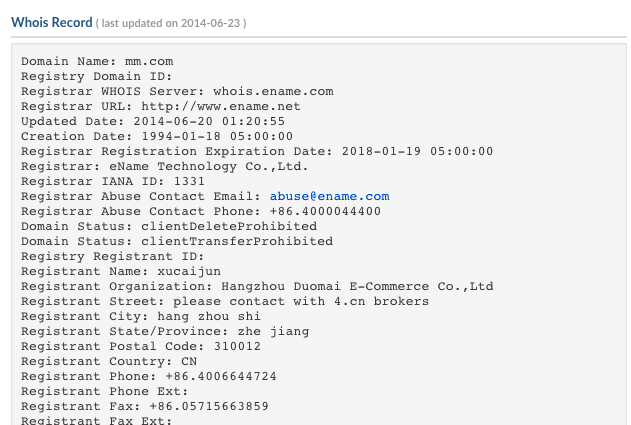 The domain name has a creation date of January 18, 1994, and the domain name was registered to the same company for as long as the DomainTools Whois History Tool has a record. I am a bit curious to know when this deal was closed. Dave’s daughter got married this weekend, and this sale is even more impressive to me knowing that it probably closed as Dave’s family was making final preparations for the big day. Congratulations to all of the parties in this large deal, and a special congratulations to Dave on the marriage of his daughter. Anyway. It is good to see 7-figure sale of LL.com, even it is just on entry level. Personally I believe LL.com are worth more: mid 7-figure range. Here I thought the buyers would have been Mars, Inc. Same, quite interesting tbh. Although, when you have mms.com in your locker you can afford to pass I guess – what’s a mil and a quarter to the makers of M&Ms though? Looks like the same guys bought bj.com as well couple of weeks ago. Elliot, you have a good relationship with Dave, right? Would be interesting to find out who paid commission, if buyer or seller. I am sure Dave won’t share that deal information with me. I am sure Dave will read this and comment if he can. When we have a domain on exclusive contract for sale the seller typically covers commission. There are rare exceptions. I would not be able to comment specifically on this deal. My opinion is that MM.com was sold to cheap. They could search or wait for a better buyer. It’s a bit funny that you are being critical of a 7 figure domain name sale. There are many, many reasons why someone would sell a domain name for 7 figures. Perhaps it could have been sold for more at some point, but perhaps it wouldn’t. There’s no sure thing when it comes to domain name values. There are plenty of times I’ve taken less money than I may have taken had I held out for the optimal offer, but I’ve used the money from those sales and made a lot more money. You don’t think Dave reached out to those obvious companies with his exclusive listing? You have to be kidding. I am sure the obvious companies would have been the first he approached. Separetely, why would Mars want to spend 7 figures MM.com? Their product is M & Ms not M & M.
Have you worked in the marketing department of a huge company like this? It’s fun to speculate how they could and would spend their marketing budget, but I don’t see too many legacy companies like this spending big money on the aftermarket for domain names, especially those that don’t even match their brand name. I completely agree with you. As I sad before this is just my opinion. It´s not funny and I wasn´t critical with a 7 figures domain name sale. I was just expressing my personal opinion about the value of MM.com domain name. As (there are many, many reasons why someone would sell a domain name for 7 figures), there are also millions of reasons to wait and sell MM.com for higher price. I´m not critical and I don´t talk about Dave Evanson work ( is one of the best domain brokers); I´m talking form the owner of MM.com point of view. If I was the owner of MM.com I have never sold for less tan $5 millions. This great domain is worth that. Once more: I don´t talk about Dave Evanson brokerage. I talk about what do I thing that MM.com domain name is worth from the owner point of view. Please check better: Mars Inc. product is M&M; (M&Ms) is just the plural form of M&M; and yes: I do work in the marketing department of a huge company even bigger than Mars Inc. I´m the marketing director of a Swiss company with presence all over the world. I´m a bit disapointed with you ELLIOT because you always disagree with third party opinions and you have not always the reason on what you wright. I´m also surprised as how a “domain investor” like you can´t see that the owner of MM.com left money on the table with this sale !!! just compare with outher LL.com & NN.com domain sales and you´ll see. Xu Caijun is CEO of 4.cn. I can’t go into details but this domain was marketed. It’s all nice to state you wouldn’t take less than 5 million but that’s not the reality. Just because another name sold for 3-4 doesn’t mean you can it just means you can MAYBE get it too. Domain’s are like houses on the same block but just because they look similar on the outside the interior inside could be very different. Maybe that house (domain) has a pool in the back, or a converted loft or extra rooms. Maybe its more modern. Every domain is unique and many get caught in that loop of “Bills name sold for $5m that means mines worth that too” then they wait 5/10/15 yrs and never get that offer. Sometimes due to your circumstances you need to decide do I take this now or do I let it go. You can’t hold onto it forever. WW.com sold to the same buyer yesterday – June 25. It may be another 7 figure sale, which will be unreported. 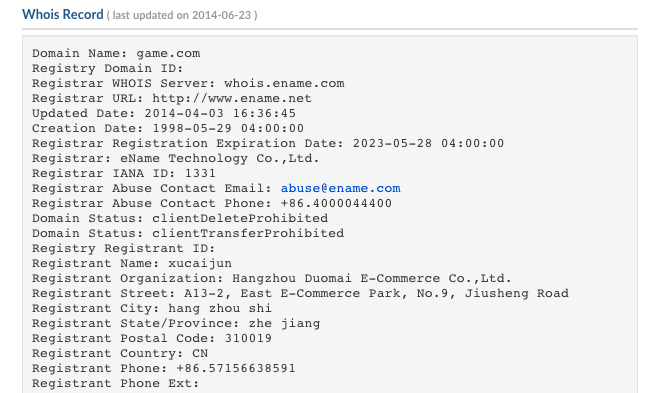 I meant WW.com sold to the same buyer, transferred yesterday – June 25. How Shane verified him reported prices? If WW.com has been sold privately and the price was not released, then Shane’s information may be just rumor that is nothing just wrong and misleading. Huh? I don’t know where his info came from. I have been emailing with the seller who didn’t disclose the price. Maybe the buyer released the info? I assume he didn’t make it up. AY.com sold to the same buyer during April. Another Top dollar deal.